The Cessna Citation M2 is a light jet (business/private jet) that is built by the Cessna Aircraft Company. Our team has gathered the specifications from various resources, which includes infrormation from the aircraft's type certificate (FAA) and published information from Cessna and Textron Aviation. Detailed information on the overall specifications and dimensions for the Citation M2 can be found below. The Citation M2 is certified as the Cessna 525 or C525, which is the Cessna Citation CJ1's model name. The Citation M2 is a continuation of the CJ1 program. Aircraft serial numbers 525-800 and up are Cessna Citation M2 jets. Certified to be flown with one pilot. Minimum Flight Crew: One pilot (in the left pilot seat) plus additional equipment as specified in the Kinds of Operations Equipment List (KOEL) contained in the Limitations Section of the FAA Approved Airplane Flight Manual (AFM) or One pilot and one copilot. Number of Seats: 8 maximum. 8 passengers max, with 2 pilots and 6 passengers. Maximum Operating Altitude / Service Ceiling: 41,000 feet (FL410). Certified in the United States under 14 CFR Part 23 effective February 1, 1965, as amended by Amendments 23-1 through 23-and 23-40; except paragraphs applicable for Engines and FADECs. 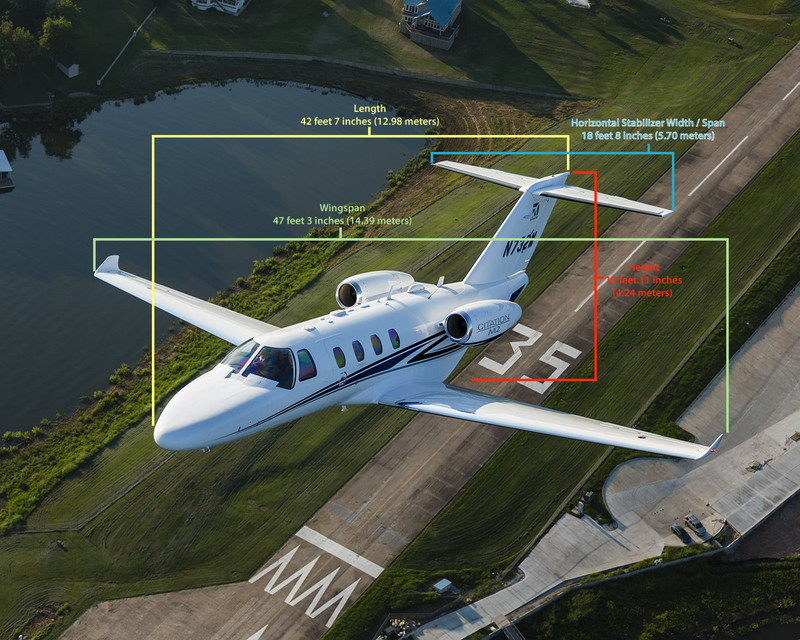 Above Cessna Citation M2 Dimensions photo by Cessna. Modified by FlyRadius. Used under the fair use provision. Two wing tanks have 1,648 pounds or 246 US gallons capacity of usable fuel. Oil Capacity (usable): Tank on each engine: 3.4 quarts usable for each engine. KIAS: Knots indicated airspeed. KCAS: Knots calibrated airspeed. 10,700 pounds: 202 KIAS (201 KCAS) Aircraft flight manual has variation for altitude and height. 60 degrees (ground flaps): Do not use while in flight. Only for ground use. Max Ramp Weight: 10,800 pounds or 4,899 kilograms. Takeoff Runway Length: 3,250 feet or 991 meters (Maximum Takeoff Weight, Sea Level, ISA and Balanced Field Length from Part 25, 15 degrees flaps). Landing Runway Length: 2,590 feet or 789 meters (Maximum Landing Weight, Sea Level and ISA from Part 25) . Climb Performance: 25 minutes to 41,000 feet or 12,497 meters (Maximum Takeoff Weight, Sea Level and ISA). Maximum Cruise Speed: 400 KTAS, 741 kilometers per hour or 460 miles per hour (+- 3 percent) (Mid-Cruise Weight, 31,000 ft (9,449 m) and ISA).